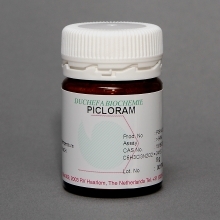 Picloram is a synthetic auxin that is often used in the control of woody plants and broadleaf plants. Auxins typically act in concert with, or in opposition to, other plant hormones. For example, the ratio of auxin to cytokinin in certain plant tissues determines initiation of root versus shoot buds.